The information is significant because it improves on the dates supplied by R C Bell in his book on Tyneside Pottery, 1971. 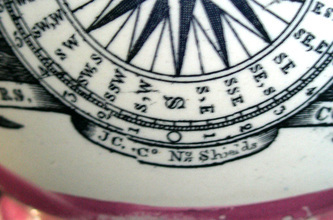 It also shows that the C. C. & Co impressed mark was likely used until 1838. The first announcement was put in the Newcastle Courant, August 23rd, 1828. It shows that the firm operated as Cornfoot, Colville & Co from 1828.
pottery at the Low Lights is for sale. 1832. It shows that the firm would continue to operate as Cornfoot, Carr & Co. Published on February 24th, 1838, in the Newcastle Journal, a second announcement advises the public of the 'demise of Mr Cornfoot', and states that the firm will 'henceforth' trade as Carr and Patton. 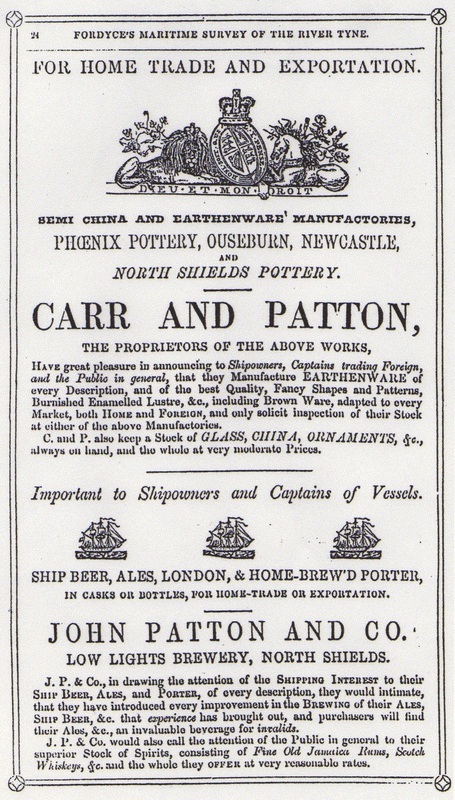 The advert below from Fordyce's Maritime Survey of the River Tyne, published in 1846, announces that Carr and Patton are now trading at the Phoenix Pottery, Ouseburn, as well as North Shields. The following announcement is from the London Gazette, later in 1846. It shows that the Carr-Patton partnership at the Phoenix Pottery was short lived. 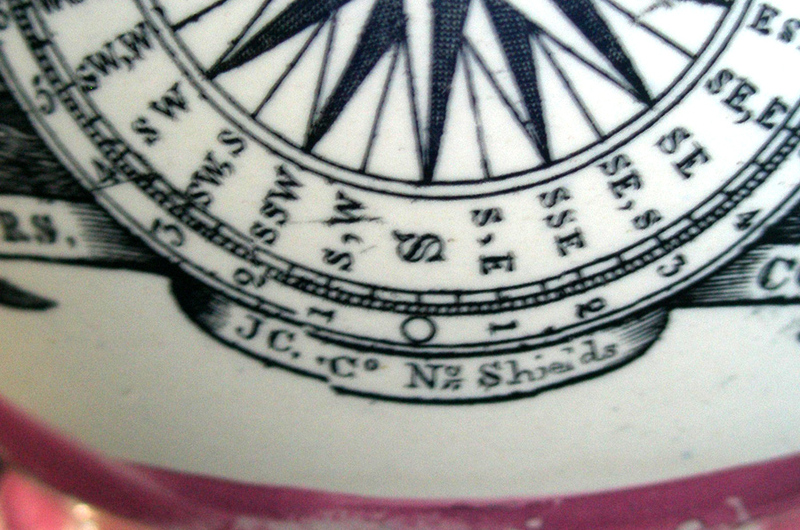 Below are two details from jugs with Mariner's Compass transfers. 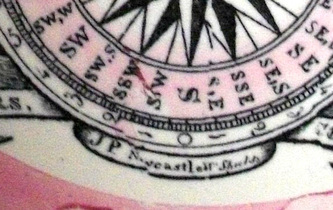 They were made sometime after the partnership dissolved in December 1846, and show John Carr continuing at what would become the Low Lights Pottery, North Shields, and John Patton at the Phoenix Pottery, Newcastle. 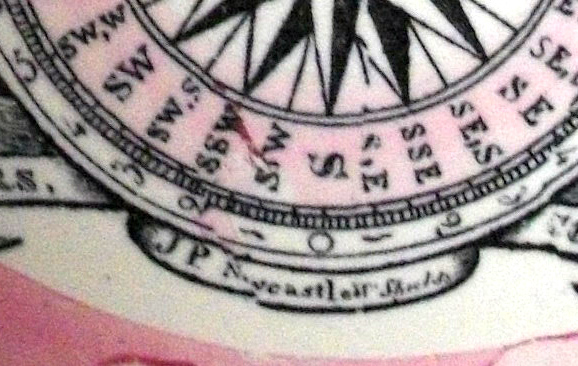 Note that the JP transfer also shows a business interest in North Shields – presumably the Low Lights Brewery mentioned in the third press clipping above. The next article, from the Shields Daily News, Saturday March 24th, 1894, shows that pottery making ceased at North Shields in 1893, and not 1900 as often quoted. A notice was put in The London Gazette, JULY 18, 1893. p4067. this 12th day of July, 1893. JOHN CARR. ARNOLD O. CARR. ROB. C. CARR. J. J. CARR.